They promise a bigger nutritional bang for your buck, but are fortified foods the ticket to a healthier pregnancy? Fortified foods like vitamin D-enriched milk or calcium-added orange juice seem like an easy way to get the nutrients you need. But are they the best way to nourish you and your baby? The answer depends on the nutrient as well as the food it's fortifying. "Adding nutrients can encourage people to look at a food as having a health halo when in reality it may be full of sodium, unhealthy fats or added sugars," says Lisa Young, Ph.D., R.D., an adjunct professor of nutrition at New York University. Plus, too much of certain nutrients could cause unwanted side effects. Here, experts tease out the science from the sales pitch. According to a study from the University of Colorado, most pregnant women aren't getting enough vitamin D. "This vitamin is crucial to the development of your baby's teeth and bones," says Elizabeth Ward, R.D., author of Expect the Best: Your Guide to Healthy Eating Before, During, and After Pregnancy (Wiley). "But many expectant moms aren't meeting the 600 IU daily recommendation." Manufacturers have been fortifying milk with vitamin D since the 1930s to prevent rickets in children, and it can now be found in fortified eggs, orange juice, cereal, yogurt and non-dairy milks like soy and hemp. Some mushrooms are even being zapped with UV rays to provide vitamin D.
Should you bite? Yes. "Few foods contain it naturally, so choosing vitamin D-fortified foods can help bring you closer to your daily needs," says Ward. The daily recommended intake of calcium during pregnancy is 1,000 milligrams. This mineral is necessary for your baby's bone development, and if you don't have enough, your baby will leach calcium from your bones. Look for it in fortified orange juice, tofu, bread, cereal and dairy alternatives like soymilk and almond milk. Should you bite? Yes, if you're not getting enough from whole foods. 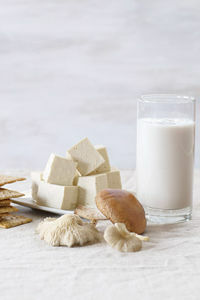 "If you're consuming three or more servings of low-fat dairy along with other natural sources, such as dark leafy greens and almonds, you probably don't need calcium-fortified items," says Young. Omega-3s, more specifically the DHA found in fatty fish like salmon and sardines, are polyunsaturated fats vital to the development of your baby's brain, nervous system and eyes, says Elizabeth Somer, M.A., R.D., author of Nutrition for a Healthy Pregnancy (Holt). What's more, Harvard University scientists recently found that adequate intake during pregnancy may lower the risk of childhood obesity. You need 200 to 300 milligrams during pregnancy and while breastfeeding. They're added to chocolate, pasta, milk, eggs, tortillas and peanut butter. Should you bite? No. "The amount of omega-3 fatty acids added to some foods is low, so you'd have to consume huge amounts to get the recommended intake," says Somer. Instead, aim for 12 ounces of seafood a week (for pregnancy-safe seafood sources, go to fitpregnancy.com/safeseafood) or take a daily supplement. We like Nordic Naturals Prenatal DHA ($29, nordicnaturals.com). This B vitamin helps protect against neural-tube defects such as spinal bifida. Recent research also suggests that consuming the recommended daily dose of 600 micrograms during the first trimester may reduce mental and emotional health problems in children. In 1996, the Food and Drug Administration mandated adding folic acid (the synthetic form of folate) to refined grains such as bread, pasta, rice, crackers and cereal. "Folic acid is absorbed nearly twice as well as the naturally occurring folate found in foods," says Ward. Should you bite? Yes, but be aware of how much you're getting. Eating fortified products in addition to taking a prenatal vitamin could cause your daily intake of folic acid to zoom past 1,000 micrograms, which can put you at risk for abdominal cramps, diarrhea or sleep issues. It's OK to include some fortified refined grains in your diet, but don't shun unfortified whole grains, such as brown rice. "Whole grains have more fiber, antioxidants and other nutrients essential for a healthy pregnancy that are removed when they are refined," says Ward. Getting the recommended 28 grams of fiber each day can help alleviate constipation, minimize cravings and stabilize blood sugar levels, which reduces your risk for gestational diabetes, says Young. It's being added to yogurt, juice, pancake mix, pasta, granola bars and frozen desserts enriched with one or more different forms of fiber, including oat fiber, bran, inulin, maltodextrose and polydextrose. Should you bite? No. "Too often, fiber-enriched foods contain mostly processed grains or high amounts of sugar and aren't healthy," says Young. "There's also no research to prove that adding fiber to foods is as beneficial as consuming the fiber naturally found in whole foods." What's more, too much inulin (an indigestible starch used to bump up fiber levels in certain foods) can lead to gas and bloating. Many women enter pregnancy with low iron levels, which is then exacerbated by pregnancy. By not getting the 27 milligrams you need each day, your risk for anemia, miscarriage and preterm delivery increases. Adequate iron also helps deliver oxygen to your baby for proper development, says Somer. It can be found added to cereal and refined grains, such as white bread and white pasta. Should you bite? No. The body does not absorb the heme-free form of iron found in fortified foods as easily as the heme-iron found in meats, says Somer. "You can boost the absorption of nonheme iron from sources such as beans and fortified foods by eating them with sources of vitamin C or heme-iron," she says. But it's nearly impossible to get your daily dose from diet alone, says Somer, who recommends a daily iron supplement. We like Rainbow Light Complete Iron ($16, rainbowlight.com). Probiotics may help alleviate such pregnancy-related digestive complaints as constipation and nausea. To reap the benefits, try natural sources, such as plain yogurt, kefir, tempeh and sauerkraut, rather than fortified foods. "The type of strains added to fortified foods have no proven health benefits or could be added in quantities not high enough to produce a desirable effect," says Lisa Young, Ph.D., R.D.